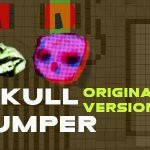 This is the original version of Skull Jumper game that I wanted to add for the purpose of comparing to the updated version, which is superior and includes dozens of new features and enhancements (https://www.scirra.com/arcade/action-games/skull-jumper-deluxe-edition-34177)Skull Jumper is a simple but challenging single-level platformer with a focus on level design and exploration. Gameplay involves navigating a densely packed platform layout, in search of an elusive goal location, while dodging 'death tiles' that instantly kill the platform character sending the player back to the beginning of the layout. Good luck! (Let me know how many attempts it took you to beat this in the comments). right arrow = forwardsleft arrow = backwardsup arrow = jump (a second time for double jump)You will want to travel upwards using the blue jump-through tiles whenever possible, on your search for the goal tile.